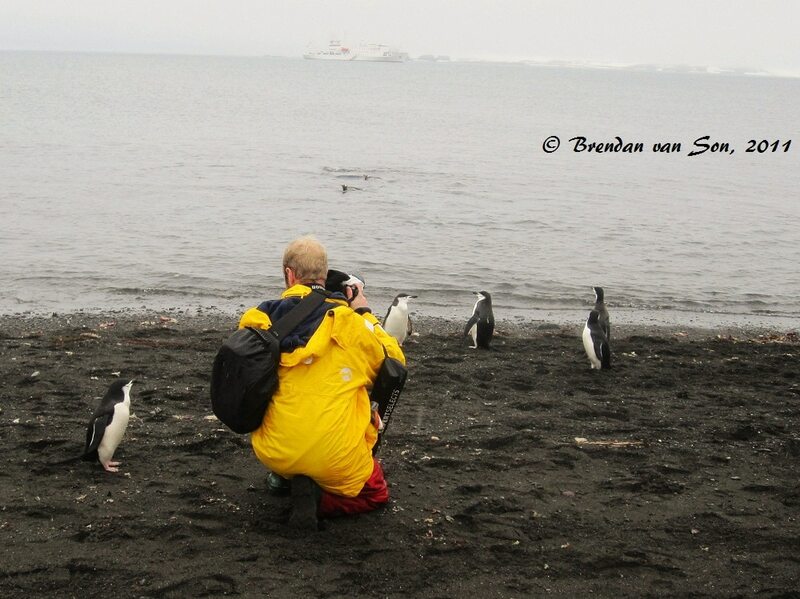 A Penguin sneaks up on me as I have a friend shoot the scene with my point and click. 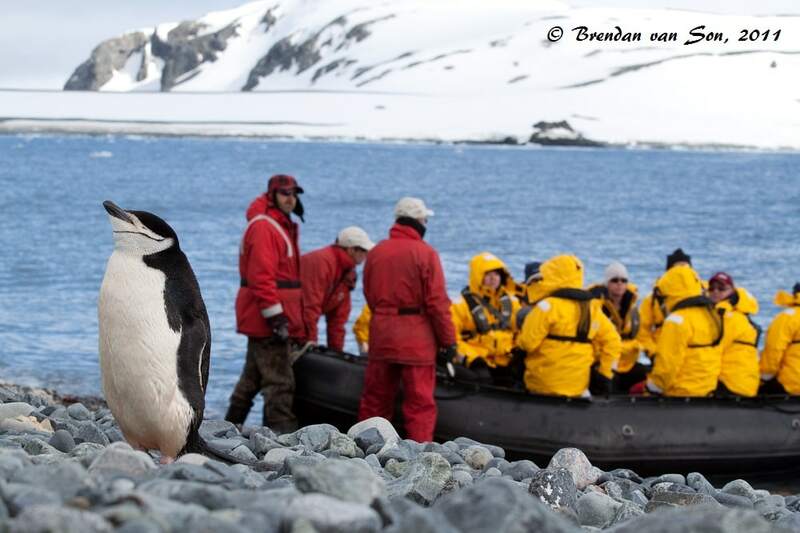 As we approach the peninsula of Antarctica we are told that we will be stopping to make our first land excursions. We will be setting off to visit a group of islands to the North East of the Peninsula known as the South Shetland Islands. In enthusiast excitement, having spent 2 days rocking our way through the Drake Passage, everyone races to put on their gear and prepare for land. The truth is, that despite the excitement it seems that many have little expectations for the island landings; it is the peninsula, of course, that everyone has come for. Excited to leave the boat we all line up in our bright yellow jackets and wait for our turn to cruise in the Zodiacs for the first time. As we bounce our way across the water towards the beach it becomes obvious that we will not be alone on this island. Our rubber boots splash into the icy waters as we step down onto the rocky beach. An excited glace immediately tells us that this is much more than just a pit stop on our way to mainland Antarctica. Well groomed chinstrap penguins greet us at the beach with confused looks as they carry on with their awkward daily routines. Brightly coated gentoo penguins waddle their way up the banks of snow on the hills towards their rocky nests. Along the beach an elephant seal trumpets out like a child annoyed to have been awoken from his afternoon nap. Overhead large birds such as skuas and petrels squawk at intruders as they warn of their nests. As the penguins stumble carelessly at your feet your eyes are drawn to the seascapes that can’t go without notice. Rocky peninsulas jut out from land and pierce the ocean’s flow. Tall pillars of rock stand tall like statues throughout the islands carved out from hundreds and thousands of beating waves and tidal currents. Resistant green mosses and bright grasses grow giving contrast to the island scene. I breathe in a deep breath of sea air while a grin stretches across my face. My camera hangs heavy around my neck, as I remind myself that some things aren’t meant to be photographed, and this feeling is one of those things. I drop down and take a seat on the beach to take in the moment and watch the penguins in curiosity. I watch silently as the penguins waddle, hop, and poke their way around their home landscape inquisitively. As a chinstrap penguin waddles up to me, it turns its head looks at me and I realize that the curiosity is mutual. As it bows its head to the ground, like a gentlemen greeting his belle, he turns and waddles off towards the hill. Most can’t wait to reach the peninsula, but little realize of the incredible nature that exists just off the main land in the South Shetland Islands. It is these moments where one realizes that although the main destination is the reason we all came, it is the journey that we will remember. Enjoying the updates. Sounds like such an amazing experience!